Are you overextended financially? Many people are, yet are blissfully unaware of how precarious their financial situation really is. Financial overextension is very easy to get into and can be very hard to extract yourself from. Months or years of financial overextension damages your financial security, leaving you vulnerable to financial devastation at any turn of events. Before you can begin to correct the problem, you must be able to recognize the problem. Here are some of the signals that indicate you are facing financial overextension. 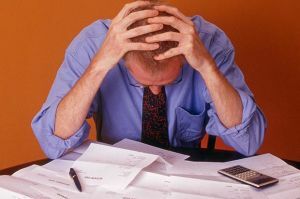 If you have a lot of debt spread out over different credit cards and you are paying close to the minimum amount each month on the debt, it is a signal of financial overextension. Roughly a third of American adults carry credit card debt from month to month with over 35 million of them rolling over $2,500 or more on their credit cards from month to month. Carrying high interest debt results in a considerable portion of your income going towards interest payments on the debt. Pay down your debt as much as you can or consider consolidating your debts into a single loan with a lower interest rate to retake control of your finances. Having difficulty paying bills is another red flag that signals financial overextension. According to a recently conducted survey, nearly a quarter of Americans are constantly late with their bills. If you’re frequently paying bills late, getting hit with late fees or getting burned by your bank’s overdraft fees, that’s generally a sign that it is time to revamp your budget and reduce your spending. Getting a handle on the problem will take time, but it will be well worth it when you have more breathing room with your finances. Neglecting to save for retirement because all of your money is going towards your current expenses is another signal of financial overextension. If your company has a retirement plan and you aren’t putting money in, especially if the company provides matching funds, you’re creating a future problem for yourself. Find a way to begin saving at least 5 percent of your current income for retirement by reducing your expenses in other areas. Once you have managed to save this amount on a regular basis, you can put a portion of any future raises or bonuses towards your retirement savings to increase the balance faster. I really agree to this article. This is very helpful for us about this Signals That Show Financial Over extension. Thanks for sharing this post. Great!